As most of you know, Seattle Speaks Up has been battling changes made to the Land Use Code in 2010 that allowed developers to reap unprecedented profits by building structures that do not fit the height and scale of their surroundings, particularly in Lowrise 3 zones (formerly 3-4 story lowrise zones). While our petition is focused on Lowrise 3 zones, we are also concerned about similar developer overreach in other residential zones throughout Seattle. City elections this fall brought TWO huge victories for our cause and have sent a clear and dramatic message to the Mayor and Council: Seattle voters are not happy with the frenzy of insensitive overbuilding in our residential neighborhoods. First, there was the unprecedented defeat of Richard Conlin, a longtime City Councilmember who was the head of the Planning, Land Use, and Sustainability (PLUS) Committee. In this very powerful position, Councilmember Conlin worked aggressively to allow developers to reap big profits by deregulating zoning rules that had protected the quality of life in all our neighborhoods. Thanks largely to contributions from developers, he amassed a large campaign war chest. His positions on a number of issues put him at odds with many Seattle residents. High on that list was his unrelenting support for upzoning in multifamily neighborhoods, while at the same time preventing any change to the generally wealthier single family neighborhoods – like the one in which he lives. For example, Conlin supported an attempt to allow businesses into residential side streets in Lowrise 3 neighborhoods in 2012 (which was defeated by huge citizen pushback). He also allowed height and scale departures for Brooks Sports’ massive corporate headquarters at 3400 Stone Way in Wallingford, which now blocks an iconic view corridor (note that Brooks’ CEO gave Conlin’s campaign the maximum legal donation – $700). Similarly, Councilmember Conlin earned the anger of many residents by ushering in upzoning in the Roosevelt district. He also initiated a proposal to change zoning to allow 400 foot towers along South Lake Union, blocking views of the lake for ordinary residents, but bringing big profits to developers like Vulcan. And, with respect to SSU’s focus, he supported changes that have allowed 5 story buildings to be built in Lowrise 3 neighborhoods. The list of developer giveaways supported by Conlin during his time as head of the PLUS committee goes on and on. We at SSU, along with many other neighborhoods groups, viewed defeating Conlin as a major goal of this election, and with Kshama Sawant’s surprise victory, our efforts were rewarded. It is instructive to review the list of Councilmember Conlin’s donors, noting how many individuals connected to real estate development donated to his campaign. Go to this link on the Seattle Elections Commission’s webpage, click the box next to Conlin’s name, specify “contributions”, then hit “retrieve”. Changing how Seattle City Council is elected – Neighborhoods take back power! 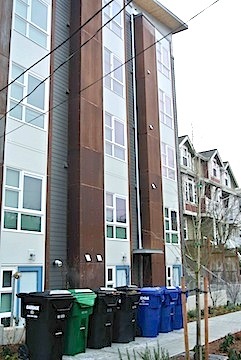 Garbage bins line the sidewalk every day in front of this new 5-story building in a residential neighborhood as voters go to the polls to dump the politicians who allowed this. The developer failed to create a space to store them. Because there was no design review for this building, the neighborhood suffers. Read more HERE. neighborhoods while simultaneously handing over multifamily neighborhoods to developers seeking to make big profits. This strategy generated large developer-funded campaign war chests, which in turn ensured enough votes to win elections handily. Meanwhile, important neighborhoods with large multifamily areas (e.g. Capitol Hill, the Central District, Ballard, the U District, Roosevelt, & Rainier Valley) lacked a representative with the perspective of someone who actually lives in those neighborhoods. Anger over the unfairness of this system led to Districts Now winning 65% of the votes in the 2013 election. Under Districts Now, all Councilmembers will be up for re-election in 2015, and seven of the nine Councilmembers will represent specific Seattle neighborhoods, with the remaining two elected at-large. The seven new district representatives will be under pressure to represent the interests of all the voters in their districts. This also means that candidates who shares the concerns of residents in their neighborhoods have a shot at defeating well-funded candidates who represent corporate interests. We are optimistic that under Districts Now candidates will no longer be able to win a seat on City Council by stuffing their campaign coffers with large donations earned through corporate giveaways that eliminate peoples’ access to sunlight, sky, and greenspace. We also hope that Mayor-elect Murray’s new administration will heed the lesson from this election: that Seattleites want to preserve lowrise Seattle neighborhoods as truly lowrise (30 feet maximum + roof) and prevent developer profiteering from turning them into midrise neighborhoods. Congratulations to everybody who contributed to our neighborhoods’ smashing November victory at the polls!